Barber’s 1833 is a cheese I know well, having eaten and cooked with it before, as well as visiting the farm and dairy last year to find out more about how it is made. You can read more about their cheddar here and about the starter cultures that are used to make it here. It’s a block cheddar, a type which many cheese aficionados turn their nose up at, but it’s one of the best and has won fans and plaudits for its quality and taste. It has a natural sweetness that’s not cloying, with a tangy edge to it. It also has those lovely little crunchy calcium lactate crystals hidden within. I’ve had this quiche in mind for a long time. Cheddar is a stalwart of the West Country and, as well as the scrumpy of the heartlands and the clotted cream of the pastures, there’s also a wealth of food to be found along the coastline. 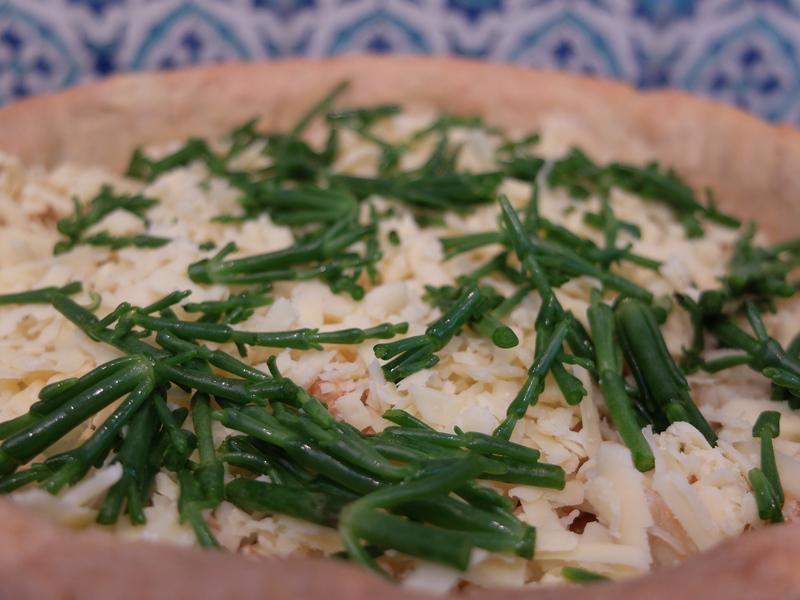 Crab and mature cheddar are a great match and samphire is a little-used but delicious complement to both. Looking a bit like a cactus or even a chubby stick insect, it’s actually a distant relative of spinach that grows abundantly in coastal areas. 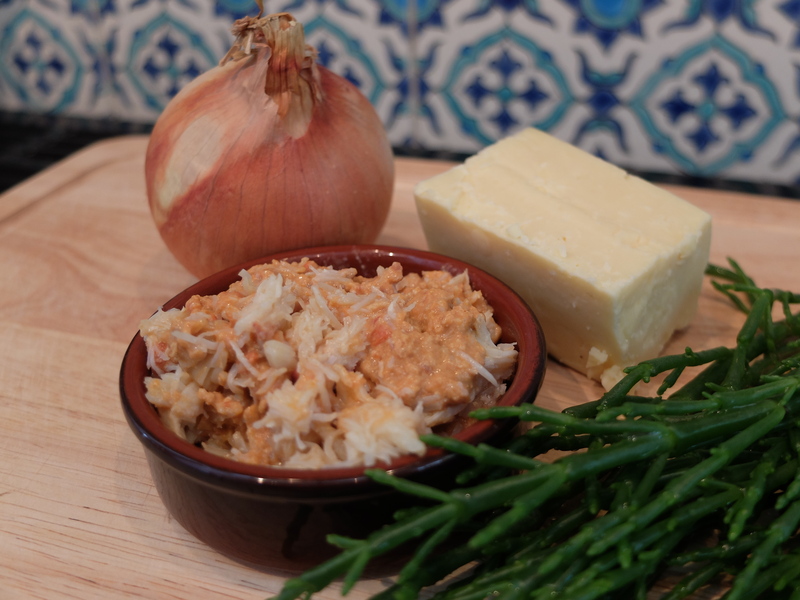 Succulent and salty, it’s a great match for crab, cheese and eggs. A summer delicacy, it’s still just in season so get it while you can. To make the pastry, rub together the flour and butter with your fingertips until it looks like breadcrumbs. Add 8 tbsp cold water, then bring everything together with your hands until just combined. Heat the oven to 200C/fan 180C/gas mark 6. 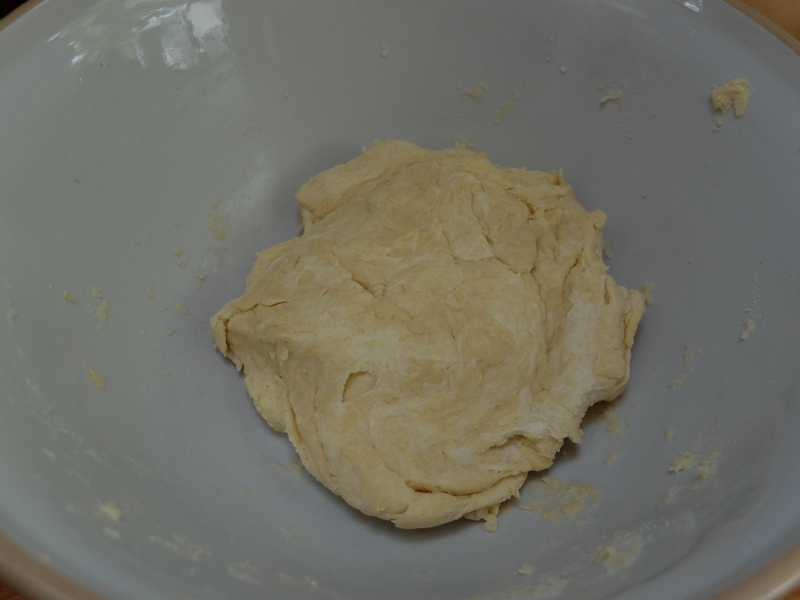 Roll out the pastry on a lightly floured surface to a round about 5cm larger than a 25cm tart case. Use your rolling pin to lift it up, then drape it over the tart case so there is an overhang of pastry on the sides. Push the pastry into the edges and sides of the tin then chill it in the fridge for 20 minutes. Meanwhile fry the chopped onion in the olive oil until it is soft and sweet but not browned. Put it on a plate to cool. 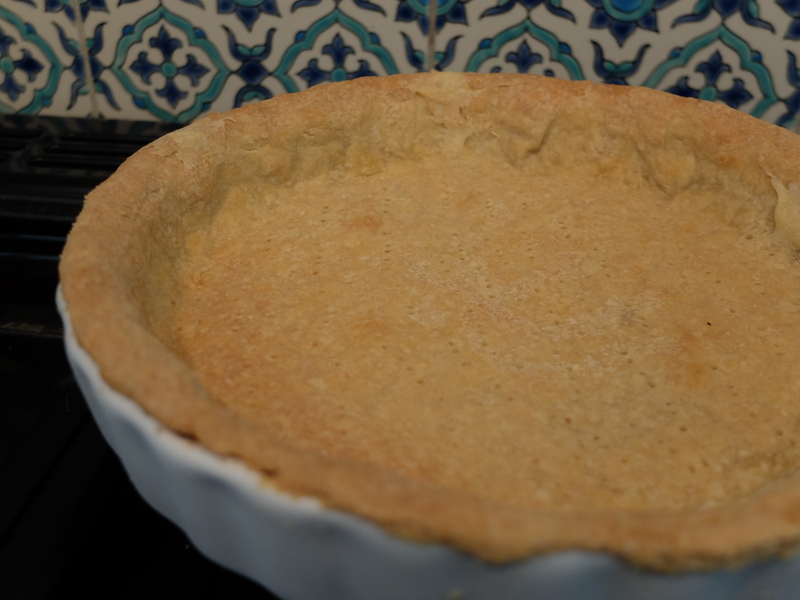 Lightly prick the base of the tart with a fork, line the tart case with a large circle of greaseproof paper or foil, then fill with baking beans. Blind-bake the tart for 20 minutes, remove the paper and beans, repair any cracks with leftover pastry then continue to cook for 5-10 minutes until brown. Trim the pastry edges to make it look neat. Brush with the egg white and then bake it for another five minutes, until the case is crisp. Spread the onion mixture over the base of the pastry case and then sprinkle over the grated cheddar and crab meat. Rinse the samphire well under running water, remove the woody ends and cut the remainder into lengths of 2-3cm. Add it to the onion, cheese and crab. Beat the eggs well with the crème fraiche and milk and season with the pepper. Pour this custard into the tart case and ensure that the filling, especially the samphire, is pushed under the custard so that it doesn’t burn. Bake in the oven for around 25 minutes, until the filling is set. Serve warm or cold. It’s all right the likes of you and Mrs. Portly banging on about the delights of samphire. To those of us living out in the sticks, yet not near the sea, it’s beyond exotic. I may have to substitute spinach *sighs dispiritedly*.Oh, I can get Barber’s cheddar though. 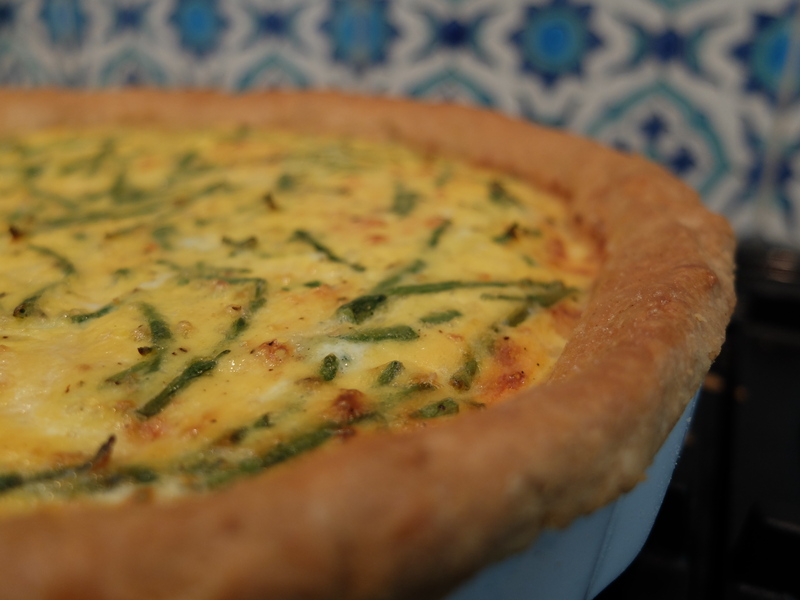 I’m loving the idea of a cheese-horse… your quiche looks pretty good too. So that’s what those lovely little crunchy bits in some cheddars are then? Calcium lactate crystals! This looks delicious! I am not a fan of crab but I haven’t had it with cheese, maybe that would make all the difference! I love samphire though . . .
ps – I wouldn’t beat yourself up about the lack of blogging, sometimes you’ve just got to do what you’ve got to do and it sounds like you had fun, so . . .